Owl Things First! 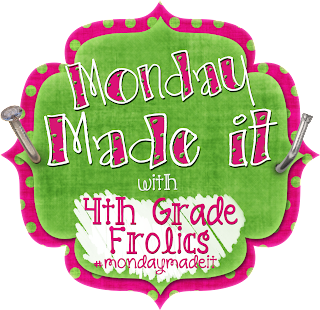 : Made it Monday GiveAway and Freebie! My old library box finally bit the dust. I have used an old scholastic box that book orders came in for years. It really held up well, but I wanted to clean up my act a little bit and have a spiffier place for students to return their books to. I found this bright yellow crate and bought some cute ribbon to weave into the holes in the box to give it a put together look. 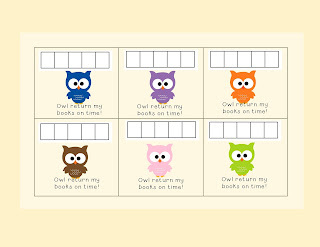 I hope this helps my Owlets remember to bring their books in each week so that they can check out more. I've tried to convince them to put their library books away in their backpack instead of down, but...You know what happens! I'm hoping this little incentive will help them remember, too! If they return their books on time five weeks in a row, they can pick a pencil out of my special pencil box! I have some great Smencils that I keep picking up on clearance, so this might do the trick. Would you like a punch card, too? click HERE for your own set! Two punch card sets are included. This is probably my favorite mat! It looks so yummy! for two days...Whoops! It DID come off! If I wasn't sold on these I wouldn't give one away! I think these are great resources for classrooms. Though they are designed for 2nd grade they would be an excellent tool for the advanced 1st grader or the 3rd grader who may need some extra practice. Would you like one for yourself or a friend? I'm offering this as well as a winner's choice from my store and a 10 giftcard to Starbucks...I love my coffee! I made one more thing today. I feel a little funny about it, but I also want to do what is best for my students. If you think this is totally inappropriate, please unfollow me! I wanted to sign up for DonorsChoose. I can't participate . . . I teach in a parochial school. DonorsChoose is only for public schools. I've always taught in a faith based school and LOVE it! I have always had students that come from families that struggle to make ends meet. My church is always ready to help families in need who are seeking faith-based education for their kids...One of the reasons I love my church family. I put a donation button over on the right along with a picture of the chairs and desks I would LOVE to have. Thank you, Karen! I headed over and found a group that will sponsor ANY school!! I'm saving my change and empty bottles to try to make my dream come true. I don't think I can do it by myself! If you would like to donate, I would deeply appreciate it! I've been chuckled at by my family, but I know that if I don't ask, I won't get anything! Thanks for listening and stopping by! Entered! Good luck, I hope you get your chairs. That's a shame that you can't do DonorsChoose!! Just because a school is private/parochial does NOT mean that the school/parents are wealthy! I hope you get the chairs and desks you want! Thanks, First Grade Circus! I was a little disappointed, but I'm not giving up! Your's sounds like my old one! All it takes is a little ribbon and a hot glue gun to snazzy it up a bit!! I see that we have a couple of things in common. I, too, like owls, and I would love new desk! Hopefully one day we'll have new desks in common! That's funny that you would ask...I woke up this morning thinking I should make some for Daily Five, AR and behavior...Guess what I'll be doing today! Great giveaway! You are awesome! Thanks, Irene! You made my day with your kind compliment! I hope it works, Karyn! Only three more weeks before I find out!! Thanks for the chance to win. I hope you get your desks and chairs. Good luck, Cecilia! I will...There is power in positive thinking! I like the Japan idea...I wish I liked Sushi! I could take those wobbly legs right off the desks and put the tops on the floor. Then we could make sitting pads or use carpet squares...We may be on to something big! I teach a 3rd grade EIP class...this would be a great resource!! These would be a great resource for you! Good luck! Love me some owls! Your blog is so cute. Thanks for the chance to win some fab prizes! Good luck, Amanda! I hope a fellow owl lover wins!! I'm headed over to see you! This would be great to win! I would go with a set for Kindergarten. I would like to have the first grade set, too! Maybe even the 3rd grade set for my math whizzes!! I would love to win this, thank you! Good luck with your donations. I'm going to make a crate for my teacher friends. Thanks for the give away! Love the crate idea. Super cute! I was also at a school that didn't qualify to sign up for DonorChoose - a special education school. It's a shame that our schools cannot benefit from that program to help our students. Just because our school is "private" doesn't mean we have all the resources we need to benefit our kids! These thinking mats are adorable! I also love your library book return bin :) Great idea to do the punch cards as an added incentive! 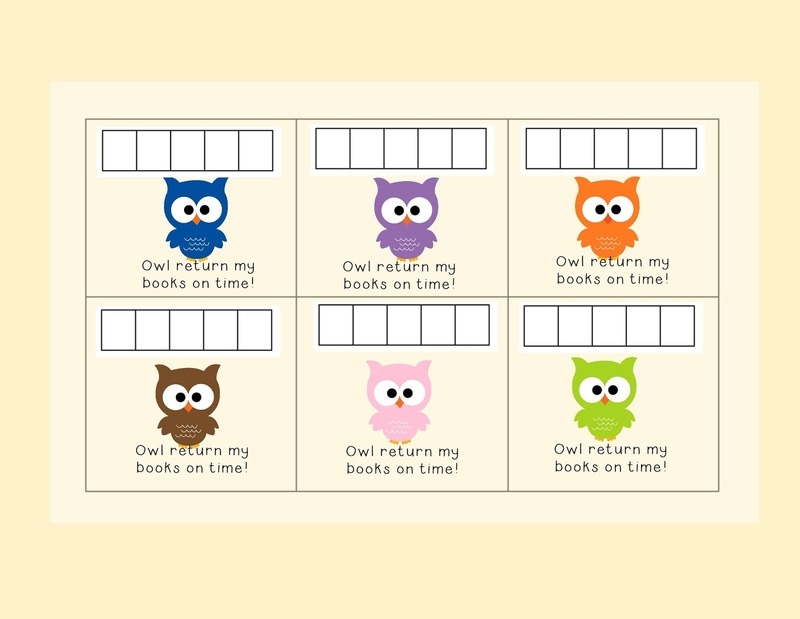 Your owl punch cards look cute! Great giveaway! Love the Owls...so adorable! I teach second grade, and this resource would be great! I'd love to win! I teach 1st! 1st Grade is such a fun grade! Love the OWLS! I have changed to owls this year and am having great fun. Love your things, spending lots of time on T-P-T.
Love your library crate! I started using a milk crate last year after my dish tub broke. I never thought about making it cute with some ribbon. Thank you for the idea. It looks so nice! I am a new teacher and could really use these items. Thanks for the chance to win! I have been so busy gathering, printing, laminating and sorting ELA stuff I have completely left out math stuff... could so use new math stuff. Thank you for the chance. I love the idea of the book return crate. I have one I can use for that! Thanks for the chance to win. Your book basket is adorable! I am so glad to read that you found a group to sponsor your chair drive. Private schools do NOT always have the funding. My nephew had to take two reams of paper to school in kindergarten, along with everything else on the list. If they don't even have paper, how can they have anything else they need? Thanks for the opportunity to win on this great giveaway.